I’ve been meaning to write this blog post for sometime now. Its about an affliction or condition I define as “AppleEnvy”. In one way or another, if you are a technophile like me, you will understand exactly what I mean by AppleEnvy by the end of this post. Apple is by far one of the coolest brands on the planet. Its right up there as one of the brands that pretty much everyone I know would like to own or be associated with, even by extension. After having a near death experience almost two decades ago, Apple has managed to claw its way back from the gallows to the very apex of technology coolness. However, what has always been true about Apple from the very beginning is that its DNA is rooted in being technology cool at every turn. To quote a good friend of mine, “Apple only ever makes really good s**t”. It took Apple to make the iPod and iTunes the leading digital music ecosystem in the world. It took AppleÂ to “re-invent” the phone by making the iPhone the coolest smartphone to-date, even as Android gains global marketshare. Lastly, Apple’s iconic laptops and desktops ala “Mac” offerings represent the highest order of consumer and business technology tools. Its a fact. Personally, I have been an Apple aficionado for the better part of three years since first owning a Macbook, which still works remarkably well to-date and has never broken down on me. Apple products simply just work – and work really well. Fast forward to last year and I finally secured an Apple iPhone 3GS. If you are one of the people who read this article and own or have used an iPhone you will know what I mean when I say that there is nothing quite like an iPhone in the world of mobile phones. Yes, I also have a couple of Android handsets and also use the latest Nokia handsets but the iPhone is quite simply on another level, honestly. The user experience is second to none and there is an iPhone app for practically anything you can imagine. To use one Steve Jobs famous expletives, the iPhone is quite simply, “amazing”. Then, came along the iPad which is now in its second iteration in less than a year so the Apple product cycles are getting shorter. I don’t own an iPad although it is without a doubt one of the coolest products from Apple to-date. Yes, there are other tablets in the market and everyone is playing catch up to Apple’s iPad but once again its on another level – which is typical of Apple products. Its therefore no surprise that Apple is now the most valuable technology business in the world, ahead of the likes of Microsoft and Google – there is certainly something they are doing right there. So. AppleEnvy. What is it? To me, the way to define it is simple. If you own or covet an Apple product then its likely that you suffer from AppleEnvy. AppleEnvy is the NEED to have the next and very latest Apple thing – whatever it may be. Its an addiction, not unlike crack cocaine or heroin. You quite literally gasp and wait with bated breath whenever Apple announces a new product. But why is this? I don’t even understand it logically but I clearly suffer from AppleEnvy. Yes, I have a Macbook Pro and an iPhone 3GS but its not enough. I want the iPad 2, iPhone 4 (or 5 when it comes out soon) and the Macbook Air 2. Yes. I want them ALL! Its illogical. I should be happy with what I have in the Apple world, but it not enough. 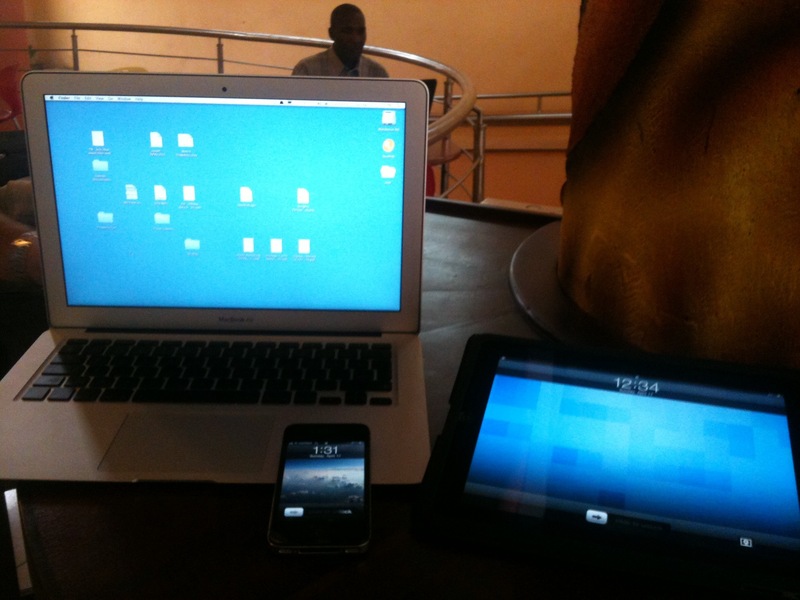 AppleEnvy in action: A Macbook Air 2, iPhone 4 and iPad 1. Follow Your Interests. Discover Your World. Twitter. As Apple’s iTunes finally launches in Africa, what are the implications for homegrown African music download services? Siri, where can I find the iPhone 4S in Kenya and for how much? Apple launches iTunes App Store in more African countries. My AppleEnvy is more peculiar! When I started YTPR, 25 years ago on 12 May 1986 – my first investment was an Apple IIc computer – thereafter I hired the first member of staff. At YTPR, we only had Apple Macs – nothing else…. and until today, we only own ONE PC!! Yes, I have graduated to a Macbook – and my first iPhone I acquired back in 2007. What next? WHich iPad>?? Too many decisions. Having been an Apple user from the pre-Mac days, I can only look on in amazement at how far we’ve come. I-perbol I call it, always bn an apple fan boy…when I’m on a pc, I feel defiled. Own a 3GS,iPhone 4 n the 27″ imac…I’ll die happy. Good read.